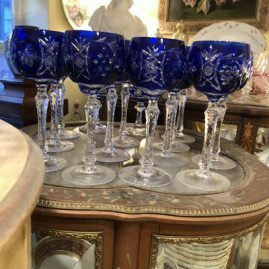 Elegant Findings Antiques Has an Extensive Selection of Antique Glassware and Stemware including Hawkes Crystal, Moser Glass, Val Saint Lambert, Waterford, Venetian Glass, Webb crystal, Pairpoint Glass, Murano and Bohemian Glass. Please click on the images below to see a larger image and a description of each item. Please call or email us if you have any questions about the items below. We have a wonderful selection of antique glassware that you can not find anywhere else. Please visit our four pages of glassware to choose some thing special for your table or special occasion. 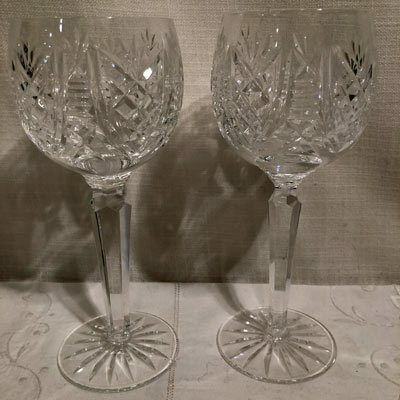 With our selection of glassware, you will be able to set your table like a queen or a king. 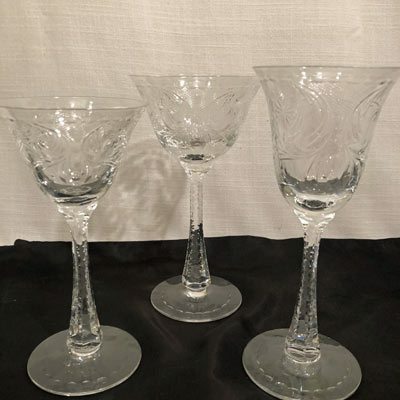 Our stemware has been chosen to serve the finest wines or other special drinks. The glasses and glassware will be a great accompaniment with any gourmet dinner you choose to serve. 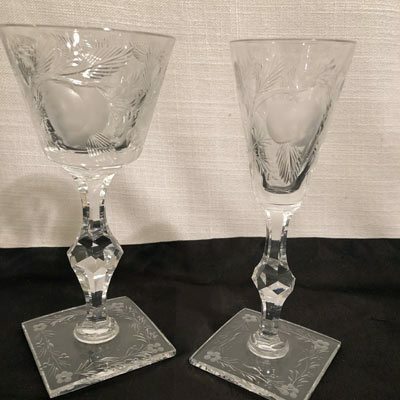 You will be the envy of all your guests when you serve with any of these antique glassware items that you can get at Elegant Findings Antiques. 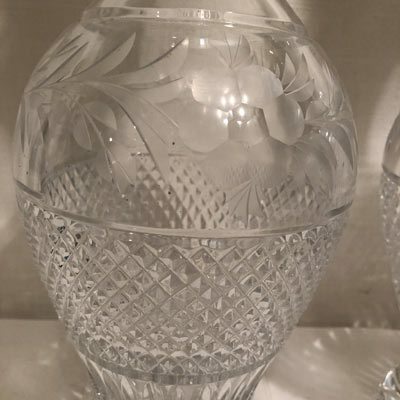 If you are looking for one of a kind rare glassware, like Moser crystal, Baccarat crystal, Saint Louis crystal, Webb crystal, Waterford crystal, Pairpoint glass or Venetian glass, please visit or call us at Elegant Findings Antiques to hear about our latest acquisitions. Cheers! 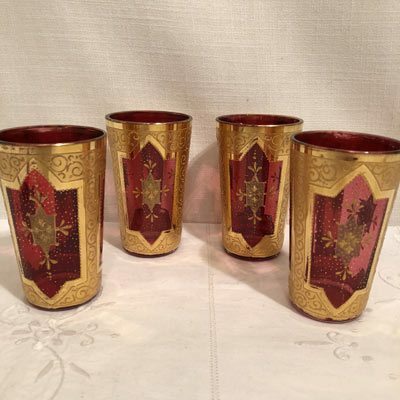 Set of six hand painted tumblers with paintings of men on horse back. 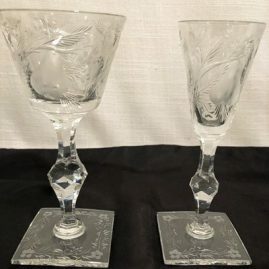 Each glass is 4 1/8 inches tall. 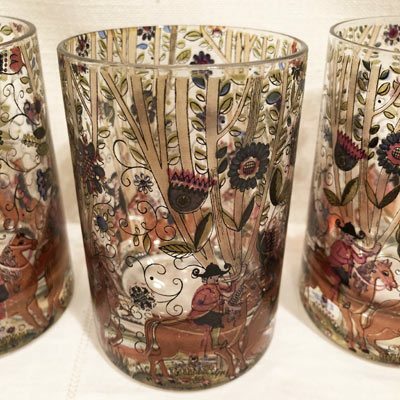 Each glass is painted with six men riding on horse back with flowers and trees. Close up of a set of six hand painted tumblers or scotch glasses with paintings of men on horse back. 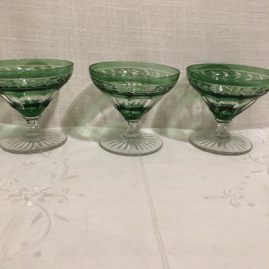 Each glass is 4 1/8 inches tall. 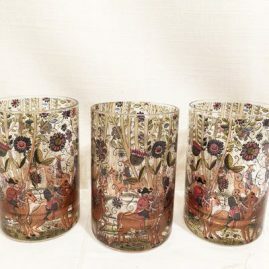 Each glass is painted with six men riding on horse back with flowers and trees. Price on Request. 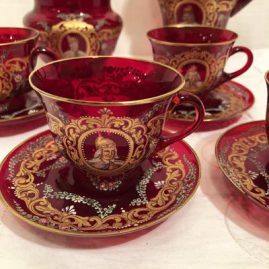 Venetian set with each piece with a different painted portrait. 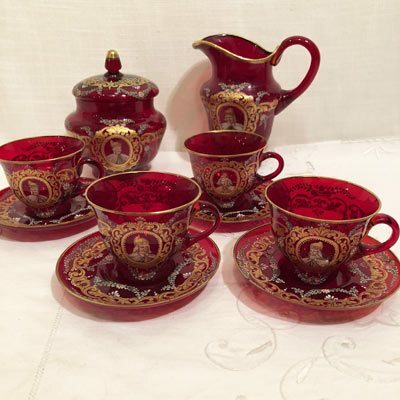 This set includes four cups and saucers, a covered sugar, 6 inches tall and a creamer, 5 inches tall. Price on Request. Close up of a Venetian set with each piece with a different painted portrait. This set includes four cups and saucers, a covered sugar, 6 inches tall and a creamer, 5 inches tall. Price on Request. 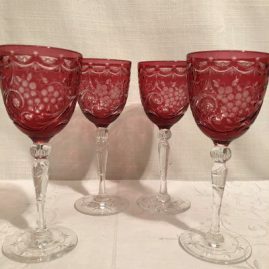 Cranberry wheel cut goblets signed Webb. Three beautifully cut cranberry wheel cut goblets. 7 inches tall. Price on Request. 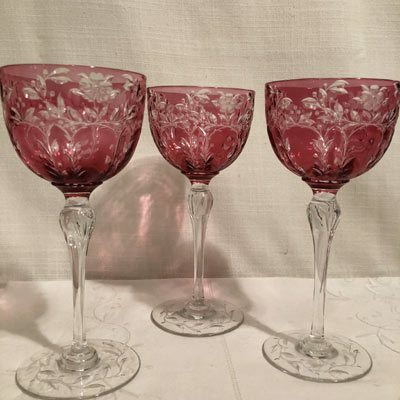 Four beautifully cut Webb crystal wines. Height-6 3/4 inches. Price on Request. Set of Baccarat stemware in the Paris pattern including 14 goblets, 7 1/4 inches tall, 6 wines, 6 1/2 inches tall, 14 white wines, 5 3/4 inches tall and 9 coupe or champagnes, 5 inches tall. Price on Request. Set of Hawkes crystal stemware with square bases. 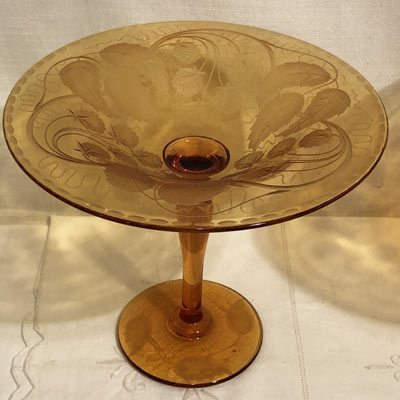 Each stem has cut pears and peaches, leaves and stems in a deep wheel cut design. 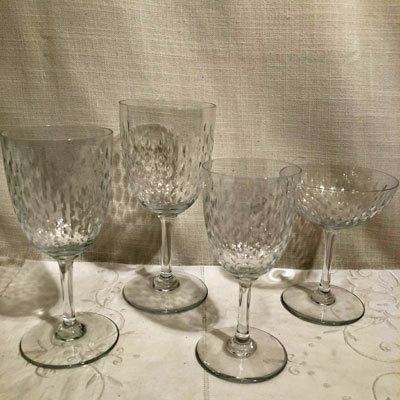 This set includes 6 white wines, 6 1/8 inches tall and 8 beautiful cordials, 6 inches tall. Price on Request. 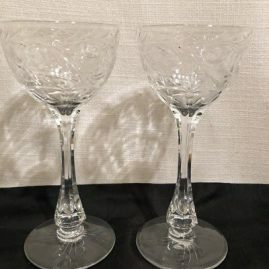 Set of twelve Bohemia Czechoslovakian goblets with cut stems. Price on Request. 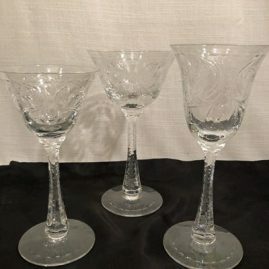 Set of Hawkes cut crystal stemware with square bases and three squares in the stem.The set includes 8 goblets, 6 3/4 inches, 6 coupes or champagnes, 4 3/4 inches tall and 6 cordials, 5 inches tall. Price on Request. 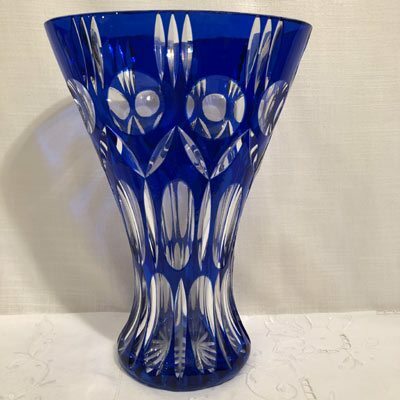 Bohemian Czechoslovakia cut crystal overlay cobalt vase. Height of vase is 12 1/4 inches. Price-$350. Fabulous signed Hawkes wheel cut crystal stemware set. 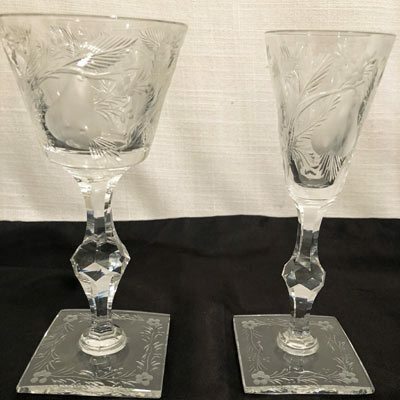 This set includes 10 goblets each with cut stems, 7 1/8 inches tall, five wines, 7 1/8 inches tall and 6 white wines, 7 1/2 inches tall. Price on Request. 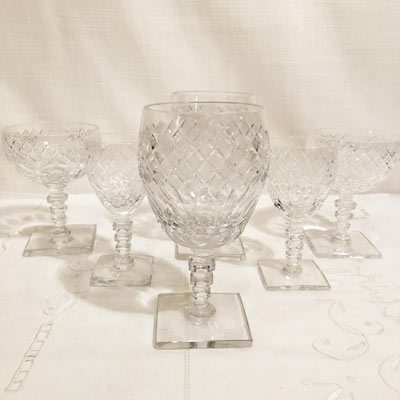 Set of 10 wheel cut crystal Hawkes ports each one is 6 inches tall Price on Request. Set of eleven cut crystal overlay emerald dessert cups or coupes. Height is 3 1/4 inches tall and diameter of the bowl is 3 5/8 inches. Price on Request. 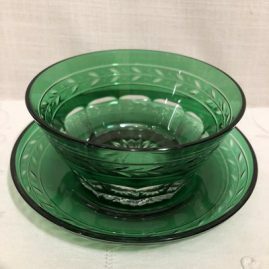 Set of 8 cut crystal overlay emerald bowls and under plates. Diameter of bowl is 4 3/8 inches and height of bowl is 2 1/4 inches. Diameter of under plate is 5 1/2 inches. Price on Request. 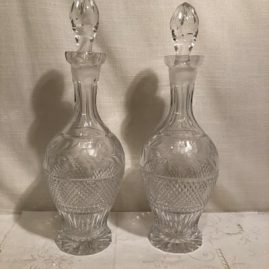 Pair of tall cut and wheel cut crystal tall decanters. Height of decanter is 15 inches. Price on Request. Close up of the pair of tall cut and wheel cut crystal tall decanters. 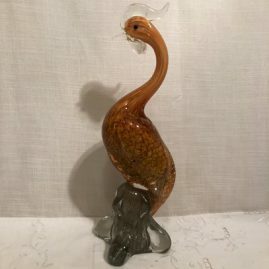 Height of decanter is 15 inches. Price on Request. 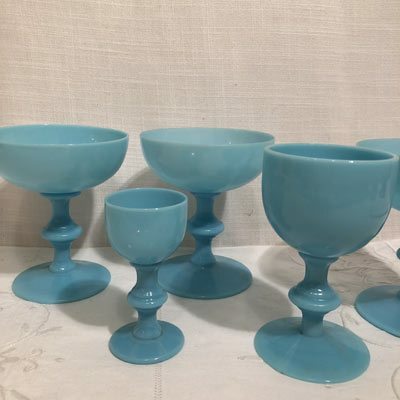 Set of blue French opaline stemware includes 12 coupes or champagnes, 4 3/8 inches tall, 10 ports, 4 1/2 inches tall and 9 cordials, 3 3/8 inches tall. Price on Request. 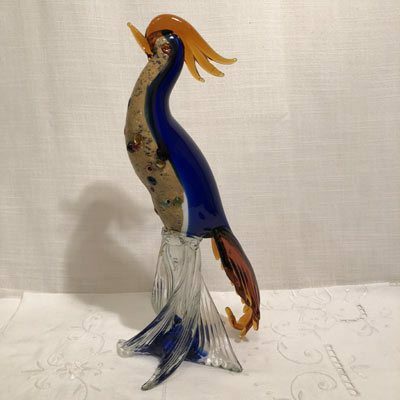 Wonderful Murano exotic bird figure with colored Murano balls on his chest. Height is 13 inches. Price on Request. Gold Murano glass figure of a Bird. Height is 14 3/4 inches. Price is $350. 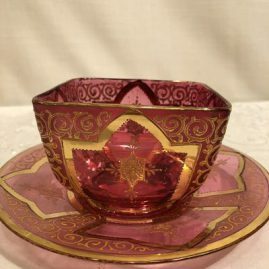 Set of six cranberry Moser bowls and under plates with heavy gilding. Bowls are 3 7/8 inches wide and under plates are 6 5/8 inches in diameter. Price on Request. Set of six cranberry Moser tumblers or aperitifs with heavy gilding. Height is 6 inches tall. Price on Request. Pair of tall gold Bohemia Czechoslavakia overlay wheel cut vases. Height is 14 1/2 inches. Circa-1900-1920. Price on Request. Pair of rare Pairpoint ambrosia wheel cut compotes with decorations of raspberries and leaves. Circa-1900-1920. Height is 7 1/2 inches and diameter is 8 1/2 inches. Price on Request. Pairpoint amethyst wheel cut console set with pair of candlesticks and bowl, each piece having glass bubble bases. Circa-1900-1920. Candlesticks are 12 inches tall and bowl is 12 inches in diameter. Price on Request. 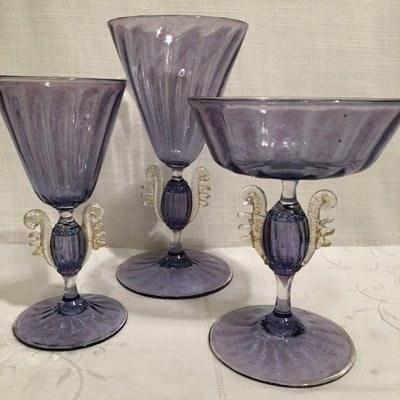 Purple Venetian stemware including 4 goblets, 7 1/4 inches tall, 4 champagnes or coupes 5 1/2 inches tall and 3 white wines, 5 3/4 inches tall. Price on Request. 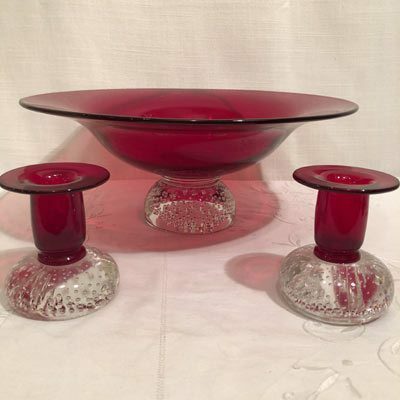 Gunderson Pairpoint ruby console set. 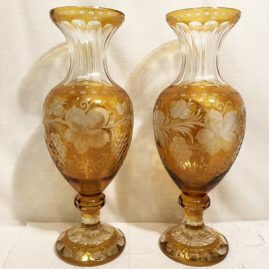 Circa-1940s with blown dot bubbles in the bases of each piece. 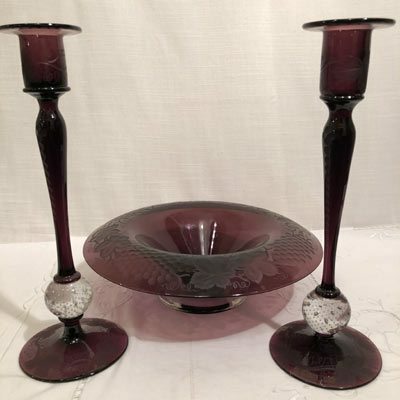 Bowl is 12 inches in diameter and candlesticks are 3 1/2 inches tall. Price on Request. 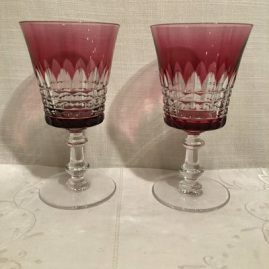 Set of eleven cranberry Val Saint Lambert crystal overlay goblets. Height is 6 1/8 inches. Price on Request. Set of seven Waterford pineapple hospitality wine goblets. Height is 7 3/8 inches Price on Request.